← Sorry Piers, we’ve got bigger fish to fry! “This is Hougang Stadium, This is Hougang Stadium”, is one of the signature chants that greets the players when the Cheetahs, as they are affectionately known, of Hougang United are engaged in battle with opposition. That particular chant though serves as more of a statement than mere taunting of the lack of support from the opponents cheerleaders. No, that chant makes the players feel that every game, irregardless of venue, is just like their home ground because the fervent support generated by the U4U clan drives them on and that they know the 12th man is there to support them through the whole 90mins. The supporters have only recently made themselves a force to be reckoned with citing the game against Beijing Guoan Talent back in 2010 as the christening of their love for the team formerly known as Sengkang Punggol. Though relatively new, they have seen the struggles the team faced that season to a team that at the present moment lies in mid-table after a third of the season. Through thick and thin they follow Hougang United (We will follow United!…) and have forged a relationship with the players as well with adoring songs such as “There’s only one Fadhil Salim” and “He’s 5 foot 3, we’ve got Diallo, who’s Freddy Mendy?”. The players themselves have taken to singing them in the changing room, such is the impact the supporters have made. 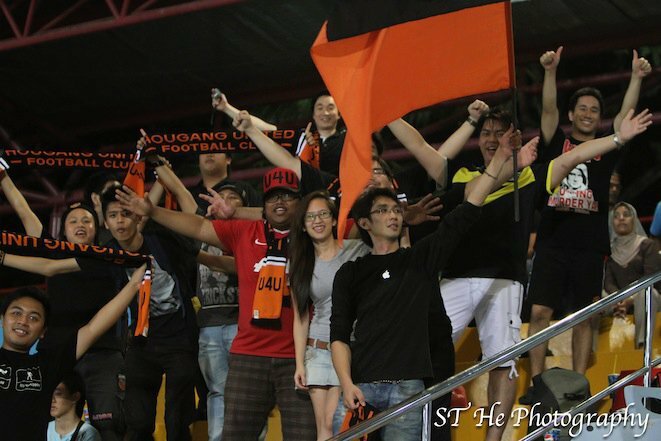 There is nothing quite like being part of Hougang United at the moment, the team is having a decent season (not the usual bottom 2 finish for sure this year) and the decent performances have led to more interest in the team which leads to more members of the fan club which leads to a more deafening welcome to any opposition team. But this is not just a PR stunt to get more people involved with the supporters club; these are a bunch of people just wanting to support a team that they love and with Hougang United FC scarves, badges and flags in tow, be sure to catch the action on the pitch with them as well as be part of the atmosphere off it at the next Cheetahs game. This entry was posted in Hougang United. Bookmark the permalink.